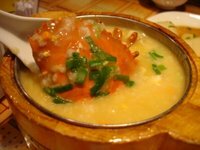 We were attracted by this huge picture, showing rice porridge tinged in orange from crab roe, topped with a crab and served in a lovely wooden urn. The dish just had to be sweet from all that lovely crab. Well, it was not bad. Quite tasty and light for a tea-time snack. Fragrant even. But this being a chain restaurant in a mall, and with its more than reasonable price, it clearly didn’t use the best or the freshest of crabs. The meat was tasteless. 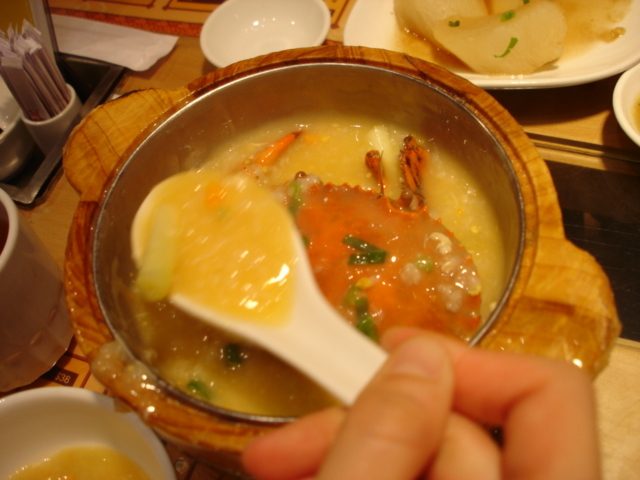 And after working on the tiny thing (it looked like the flower crab) after a while, we just gave up and stuck to the porridge.